I am so damned proud of this FO. It is my very first finished quilt. I might have started it months ago, but I finished it! 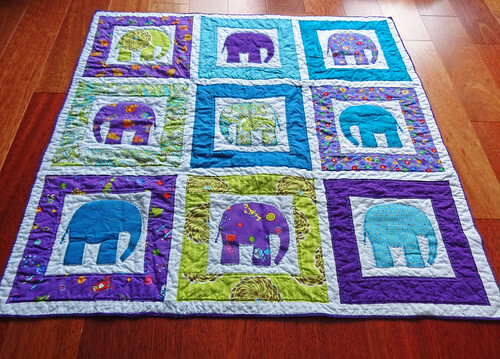 It is, of course, my Cirque d'Elephant Quilt, designed by Sew Much Ado. I hate that these pictures are so washed out, but it iscaused once again by the weather we are having in the UK. I think the pictures from this post show truer colours. In a way I wish I hadn't pressured myself to finish this quilt in time for Christmas, because left to my own devices I'd still be hand quilting it. 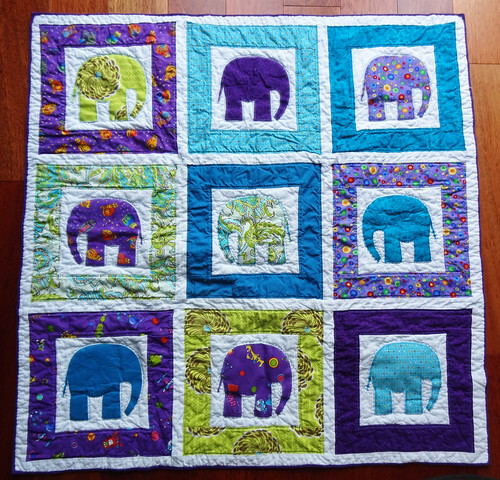 I enjoyed hand quilting around the elephants in the beautiful turquoise perle thread so much, I probably would have ended up hand stitching with it all over the elephants bodies too! That probably wouldn't have looked so great because of the heat'n'bond stiffening the fabric. If I'd carried on filling the white areas, it might have been more successful. 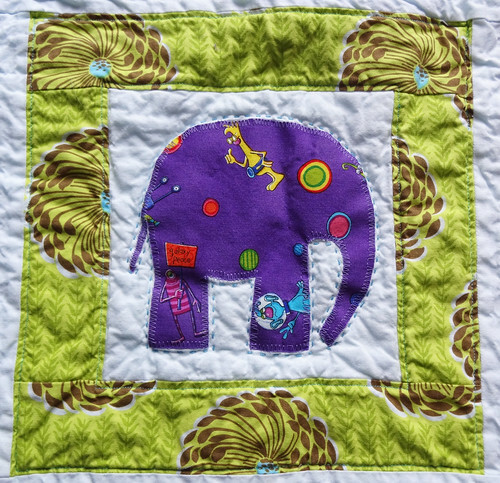 Other than the hand quilting I machine quilting in straight lines 1/4" inside each of the coloured fabric "frames" around each elephant. I used a walking foot, which helped, but there were still areas of puckering. Mind you, those areas seem to have disappeared in the wash and tumble dry! On thing that didn't completely disappear was a bit of the backing fabric that got ripped when I was ripping out a wonky seam. 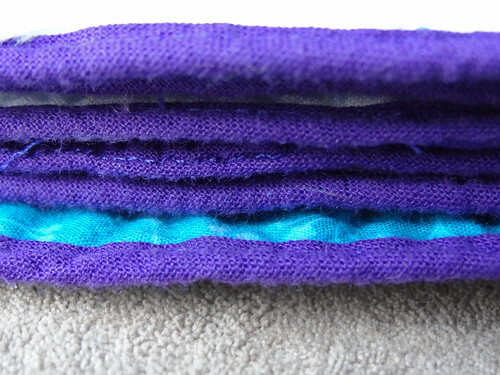 After practically crying with frustration, I got my thinking cap on and used a tiny scrap of the trimmings of the backing and ironed on fusible interfacing to give it strength and sewed it over the hole in the fabric. I'm pretty proud of how well it is hidden. To be honest, it took me ages to find it photograph, and I knew it was there. 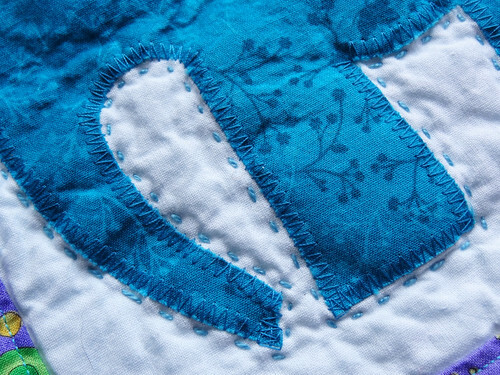 You can see the Aurifil 50wt thread I used for quilting in the above photo. I'm pretty happy with the colour choice and I loved using this thread. It was a dream to sew with. You can see the shape of the quilting better on the back of the quilt. After the disaster of not having enough fabric to have a single piece for backing, I love the way it looks. 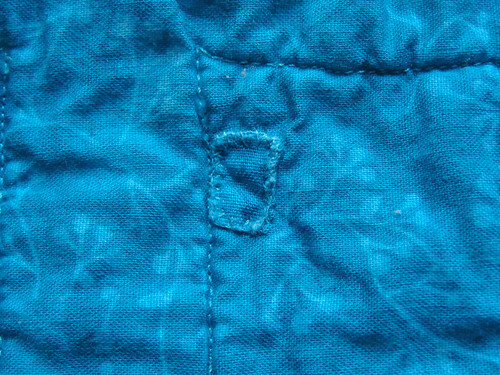 It was extra effort, but the "window"on the back with my favourite piece of fabric on the quilt is great. Can you see the little black label on the bottom left hand corner in the photo above? I thought of doing a proper embroidered label, but time caught up with me and I decided to just used the labels I already had for other sewing projects. The fabric in the window was this one. Who could resist those cute aliens, who wish for Galaxy Peace? Over the course of making this quilt, the thing that caused the most problems was the binding, as I explained in this post. In the end I decided to rip off the spare binding from my test piece and attach that to the end of the binding I had and it just about stretched around the quilt. The binding really was very narrow, but with a quilt this size it didn't mess with the proportions too much. I have got some extra Kona in my fabric stash as a result of my humming and hawing over the binding, but I couldn't face starting again on the binding in the time I thought I had left. 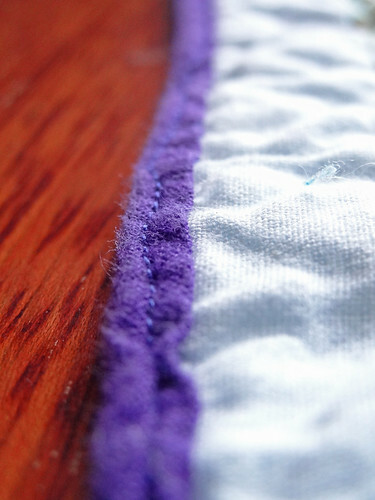 This skinny binding did make for wonky stitches with having to sew so close to the edge of the quilt. Thank goodness for an edge of fabric foot! Because the binding was so skinny and my stitching so wonky, after washing and tumble drying the quilt, the stitching on the binding came away from the main body of the quilt. In a couple of places I was able to anchor the binding back down by hand sewing, but in one section I unpicked all the machine stitching and started again. In the end it was all pretty neat and no one will know it is there but me - and now you! 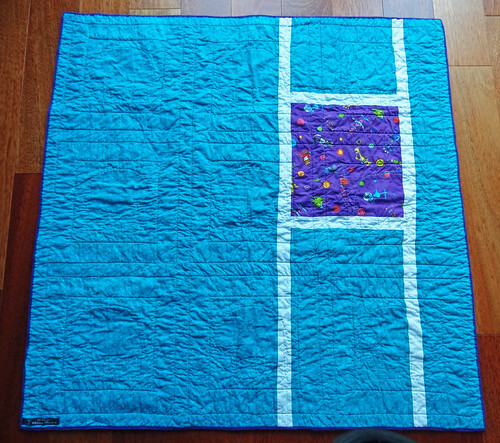 I am pleased that with all the problems that occurred with this quilt I was able to solve them with the aid of my lovely bloggy friends, the Internet and my own thinking. 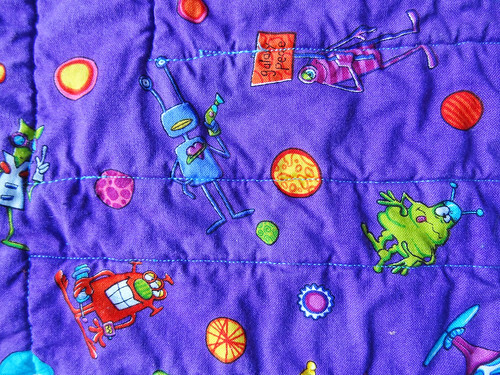 I can't wait to see my nephew playing with his new quilt, when we finally get to have our very belated Christmas! Yes, sadly I have yet to give away half my made Christmas gifts because we have been delayed in our Christmas visit by illness, weather and holidays. I really should wrap it up before I give into the temptation to keep it! For other finished objects, click on the button.